Royal Ascot has a long tradition of welcoming horses year after to year to contest major championship races. From 1849 up until the First World War this was done through a series of three races known as the Triennial Stakes, with that name appearing three times on the racecard during Ascot week. The first leg was a five-furlong race for two year olds. Then came a seven-furlong event for three year olds. The series concluded with a two-mile heat for four year olds. Sensibly, it was not a condition of entry to the later races that a horse had taken part in the first contest. Invariably, that would have led to a small field for the last race, as relatively few horses progressed to run at two miles on the flat. I can find no indication that any horse actually won all three legs of the Triennial Stakes, and perhaps this is one of the reasons it was discontinued after the Great War. However, two of the races do continue in the current Royal Ascot programme. 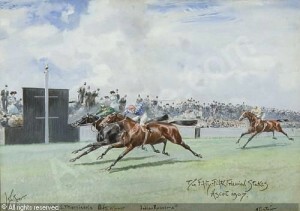 The Chesham Stakes was established in 1919, originally over the same five furlongs as the two-year-old race it replaced. Over time the distance was extended, first to six furlongs, and then in 1996 to seven furlongs. Today’s opening race, the Jersey Stakes, replaced the second leg. History continues unchanged here, for it is still run over seven furlongs, and restricted to three year olds. Perhaps more than any other race at Ascot, the winner of the Jersey Stakes is a horse that is likely to go on and make a name for itself at stud. Many have done so. Indian Ridge (1988 winner) sired Linngari, who won Group 1 races in Germany and Italy, and also Ridgewood Pearl who took the Coronation Cup at Royal Ascot in 1995. Observatory (2000) fathered Twice Over, winner of both the Eclipse and Champions Stakes in 2012, and the Juddmonte International at York last year. Twice Over will be bidding for a second Eclipse win in a couple of week’s time. Mozart (2001) sired only one crop before he died at the age of four, but there were signs in the likes of Amadeus Wolf and Dandyman that he would have continued to supply top quality horses. One of the more recent winners to have started his stud career is Kheleyf (2004), who was champion first season sire in 2008, and champion sire of two year olds last year. If this year’s Jersey Stakes winner is a colt we won’t know whether he will go on to emulate these for two or three years. But if it’s one of the geldings or fillies in the race we’ll know immediately it’s been run.